Home | *Blog | The World’s Fastest-Growing Religion? 882 people read this post. Some months ago, I participated in an interfaith dialogue meeting. There were people from different faith backgrounds there. They spoke about the religion they followed or claimed to follow. Some of them may have also thought that they were present in order to ‘represent’ their faiths. But what about me? What was I doing there? What religion did I follow, or claim to follow? What religion, if any, was I claiming to ‘represent’ at the meeting? Over a period of several decades I had been through several religious phases, each time identifying with one religion or the other. While in each such phase, I had desperately wanted to believe that the particular religion that I happened to identify with just then was the Ultimate Truth. But inevitably, after some time, disillusion and disinterest would set in and I would find myself moving on to some other religion. In this way, over a period of several decades, I must have been through half a dozen or so religions! There was one common thread that linked these successive phases in my life. While in each such phase I had an emotional attachment to a particular religion, my de facto religion, I now realise, remained one and the same: Hedonism. Wikipedia.com succinctly defines Hedonism as “a school of thought that argues that pleasure and happiness are the primary or most important intrinsic goods and the proper aim of human life.” Hedonism is probably the fastest-growing religion in the world today. It is followed (although they wouldn’t themselves admit or even know it) even by vast numbers of people who think they practice one or the other conventional religions. 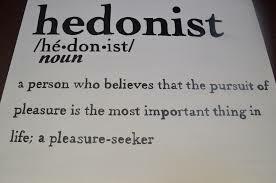 Despite being a missionizing faith that might very soon turn into the world’s largest one (if it hasn’t already), Hedonism has not been anywhere officially recognized as a religion. No one seems to talk about it much, as if it doesn’t even exist. This is particularly unfortunate because today the religion of Hedonism is at the root of the multiple crises—at the global, national, and individual levels—that the world is beset with. From inter-communal and international conflicts to terrorism, war, the global environmental crisis and the rapid collapse of values and morality, every challenge the world is today faced with can be linked, directly or otherwise, to the rapid expansion of the religion of Hedonism. The crisis of faith in most religious communities worldwide is also, at root, a result of the massive missionary successes of this creed. 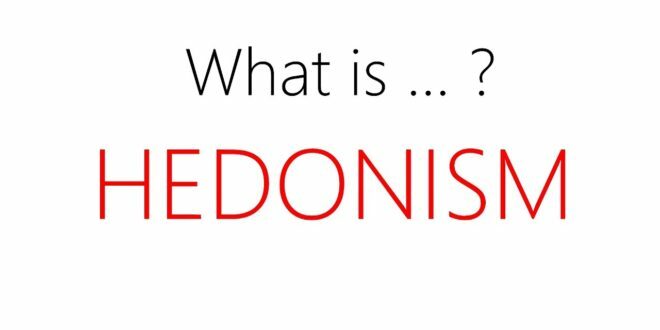 If by a ‘religion’ is meant a worldview consisting of a set of beliefs and related practices that provides its adherents with an explanation of the ultimate meaning and purpose of life, then Hedonism is without doubt a religion. According to Hedonism, the real purpose of life, the only reason why we ought to exist, is to maximize our experience of pleasure, which, in turn, can be had through the maximum possible stimulation of one or more of our five senses. The understanding being that this is the only life there is, Hedonism declares that one must make ‘the most of life’ by maximizing one’s sensual enjoyment or ‘happiness’. Man being thought as the physical body alone (just a lump of atoms stuck together by chance), stimulating and seeking to fulfil the (never-ending) desires of the body and maximising the ‘happiness’ therefrom is what the ‘good life’ is all about, Hedonism avers. There being, according to votaries of this religion, nothing as the soul, and, therefore, no life after our physical death, Hell and Heaven are here not something that one experiences after death. Rather, they are here, in this very world. You are in ‘Heaven’, Hedonism preaches, when you experience the satisfaction of your sensual desires. Hell is when you fail to do so. But since there is no limit to the sensual desires for a Hedonist, his or her spell in ‘Heaven’ is necessarily fleeting—limited only to the brief moment when he experiences a certain thrill on having a particular sensual desire fulfilled. Because not all one’s sensual desires can ever be fulfilled, and since even when desires are met the pleasure therefrom lasts only briefly, a Hedonist is necessarily condemned to live in miserable dissatisfaction—in what is for him ‘Hell’—save for the brief moments when he savours the short-lasting pleasure of a particular sensual desire having been satisfied. Hedonism is an aggressively missionizing faith. Among its most vociferous apostles are the ‘modern’ education system (which has little or no room for God and traditional piety common to the conventional religions and which brainwashes innocent minds into believing that the purpose of life is to become ‘rich and famous’ and to ‘make it big’), the mass media, and the advertising and entertainment industries. Hedonism has its own places of pilgrimage too—shopping malls, amusement parks, bars, and discotheques and so on—which have assumed the place that places of worship once enjoyed in the lives of many people. Love for the world and love for God simply cannot go together. Hedonism and devotion to God are necessarily mutually antagonistic. All major religions, including even those that are not theistic (such as Buddhism), can be thought of as methods to overcome the self, whereas Hedonism teaches just the opposite: maximum self-indulgence and worship of the self. Hedonism is thus by definition itself deeply opposed to all traditional religious faiths. Many of us may claim to follow this or that conventional religion, but if in practice—as was the case with me for many, many years—our de facto ‘religion’ is Hedonism, these claims of ours have no merit at all.